The Auckland central business district (CBD), also called the city centre by Auckland Council, is the geographical and economic heart of the Auckland metropolitan area. The area is made up of the city’s largest concentration of skyscrapers and businesses, which form an iconic skyline. The CBD is one of the most densely developed places in New Zealand, with many commercial and some residential developments packed into a space of only 433 hectares (1,070 acres). Bounded by several major motorways and by the harbour coastline in the north, it is surrounded further out by mostly suburban areas. 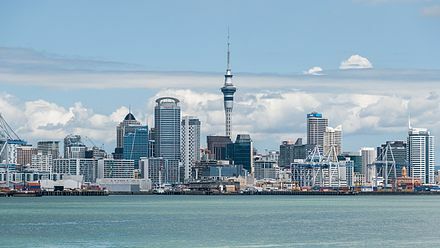 Located on the northern shore of a narrow isthmus, the CBD extends from the Auckland waterfront on the Waitematā Harbour southwards along Queen Street and a number of other parallel-running streets. The CBD is generally considered to be bounded by the main motorways that surround all non-harbour sides, with State Highway 1 forming the southern and western boundaries, and State Highway 16 / Grafton Gully forming the eastern boundary. The CBD has an area of 433 hectares (1,070 acres), similar to the Sydney CBD, and twice as large as the CBDs of Wellington and Christchurch. The CBD is to a substantial part located on reclaimed land of the Waitematā Harbour. For a closer discussion of this aspect, see the Commercial Bay and Auckland waterfront articles. The town of Auckland was created in 1840 with the first European colonisation of the area, marked by an official ceremony on the now non-existent Point Britomart. The initial centre of the new town was focused on what is now the corner of Shortland and Queen Streets, which was at the shoreline of Commercial Bay. From approximately their junction, the main wharf ran north off the end of Queen Street, with Shortland Street leading up to Fort Britomart and Government House, around which many of the richer people built houses. Shortland Street tended to be the location of the more important businesses and most of the ‘luxury’ shops of the mid 19th century. The 1850s onwards saw an increasing number of businesses, and especially retail, locating further south along Queen Street, which still to this day forms the ‘spine’ of the area. In 1841, one year after the European founding, the census counted approximately 2,000 people, with “mechanics” the largest group at 250, and other groups of note being 150 agricultural labourers, 100 shopkeepers, 100 domestic servants, and 125 “upper class members”. During the remainder of the 19th century, Commercial Bay was progressively filled in, allowing a northward extension of Queen Street and the creation of Fort Street, Customs Street, and Quay Street. The part of Queen Street north of Customs Street is today referred to informally as Lower Queen Street. As well as being the location of a great many multi-storey warehouses, initially the Lower Queen Street area also contained many manufacturing businesses, though many of these started to move to other areas such as Freeman’s Bay, Newton and Parnell, especially if they took up a lot of room (such as timber yards) or created noise or pollution (such as brick yards or foundries). Up until the middle of the 20th century the centre of town still contained a large number of small factories including clothing manufacturers. The relocation of industries to outlying suburbs became especially pronounced in the 1950s, partly due to incentives made by council planners to create industrial areas in Penrose and Rosebank Road (amongst others) and thus rid the inner city area of noise, pollution and heavy traffic. This was mirrored by the development of suburban shopping malls (the first being LynnMall in 1963) which enticed retailers to vacate the inner city as well. Attempts by the council to halt this pattern by constructing numerous public car parking buildings met with varying success. The rise of suburban supermarket and mall shopping that was created in places such as Pakuranga from 1965 onwards has been added to by the appearance of Big Box retailers in places such as Botany and the North Shore. Residential numbers in the inner city (including the inner suburbs) were also declining in the 20th century from as early as the 1920s. In the two-mile zone surrounding the CBD, there were approximately 70,000 people in 1926, with only around 50,000 in 1966 – a change made even more marked by the development of the remainder of Auckland’s population, which grew more than fourfold in the same timeframe. In the 1990s, only a token population of around 1,400 was still residing within the CBD, though this was to grow substantially with a boom of new apartment buildings around the turn of the millennium. Around 24,000 apartment units exist as of 2010.
southward direction. From those origins, it has grown progressively, and become much more densely built-up, now being an area of high-rise buildings mainly used for commercial and retail uses. It has the highest concentration of arts, culture and higher education institutions and venues in the country. Some commentators have noted that the recent decades have not been kind to the aesthetics and the community values of the inner city. The demolishing of many older buildings, often the prerequisite for low-quality or uninspired new office and residential developments, is considered by them to be due to a combination of developers uninterested in long-term outcomes as well as due to Council planning direction being too weak. In an attempt to reverse the decline of aesthetics in the CBD, previous Auckland City Councils and the current unitary Auckland Council have instigated several urban regeneration schemes. These include the recent redevelopment of Aotea Square in 2010 and the upgrade of Saint Patrick’s Square in 2009. The area east of the Britomart Transport Centre is currently undergoing major changes, with the development of new commercial buildings, development of public spaces and restoration of several heritage buildings. Another major regeneration scheme currently underway is the redevelopment of Wynyard Quarter, which involves replacing industrial facilities covering a large portion of the CBD waterfront with residential or commercial buildings and public spaces. The Auckland CBD is one of the few places in New Zealand that has skyscraper-sized buildings, such as the Vero Centre, ANZ Centre or the Metropolis, with the Sky Tower rising above them.